SuDS (Sustainable Urban Drainage Systems) provide cities with new means and techniques for a sustainable approach to city rainwater management, integrating run-off management in the urban landscape, based on the natural behaviour of the river basin at issue prior to urban development. SuDS, which are being increasingly applied worldwide, thus return water to the surface, enabling it to exist together with citizens and to enhance our daily urban landscape. 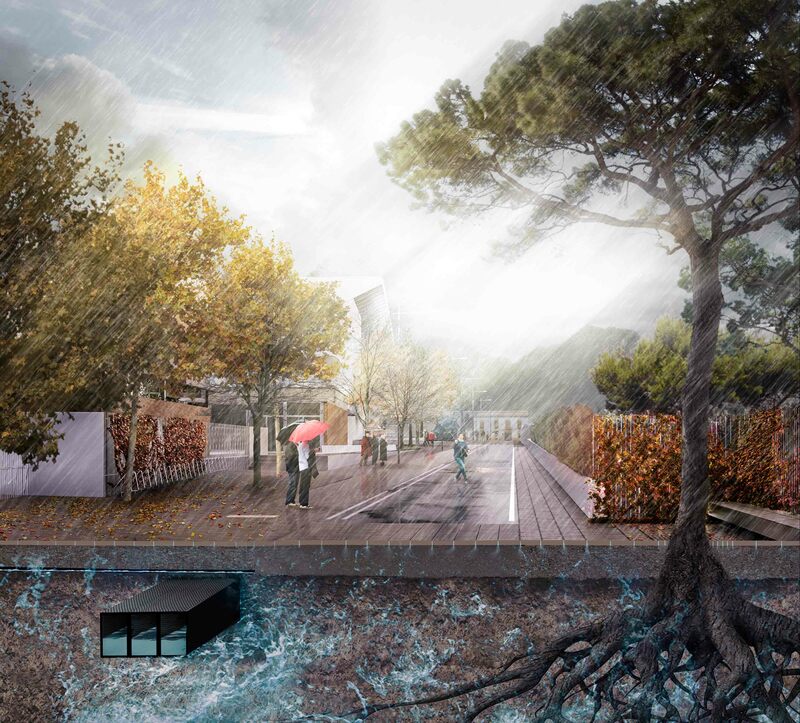 The demonstrator envisaged for Benicàssim involves construction of a sustainable urban drainage system via development of a permeable ceramic flooring, using ceramic tiles of low commercial value. 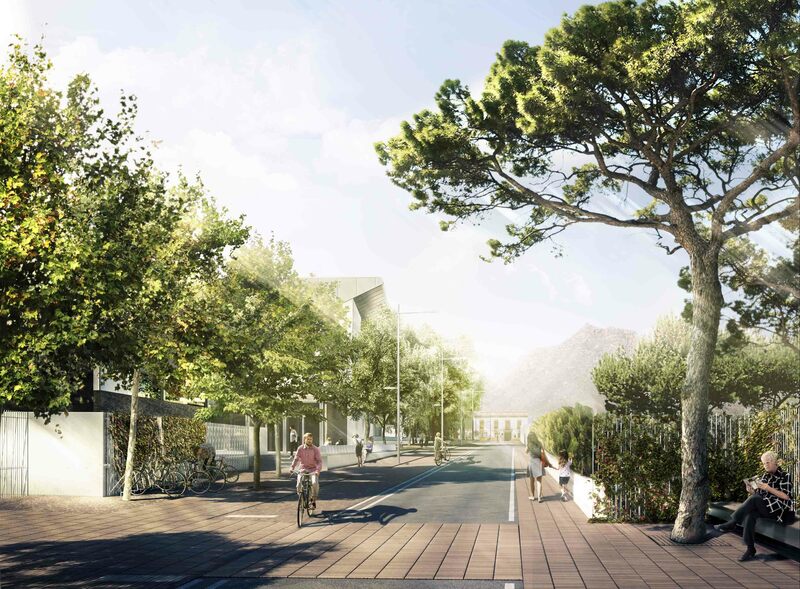 The space foreseen for the demonstrator consists of a street section with light and pedestrian traffic in an established urban setting of about 3000m2. Demonstrator monitoring will contribute to the evaluation and dissemination of SuDS, in particular to that of permeable ceramic flooring, making these systems reference solutions for actions linked to the creation of Urban Green Infrastructures in established settings. The demonstrator is located in Benicàssim, a municipality with a resident population of 18,098 inhabitants (Spanish National Statistics Institute (INE), 2015), a population that grows to more than 60,000 in summer, as the municipality’s economy is based on tourism. 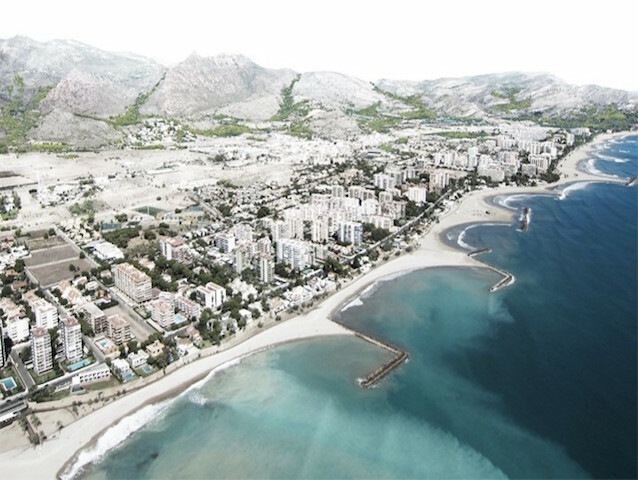 The municipality, on the Castellón province seaboard, is characterised by its excellent location, surrounded by the Desierto de las Palmas, one of the most emblematic sites in the Valencia Region, declared a “Natural Site” in October 1989. Sant Vicent street, selected for the intended development of the demonstrator, is an arterial street that links the municipality to the coast, specifically to Sant Vicent Tower, built in the 16th century, at the southern end of the Bernat Artola promenade. 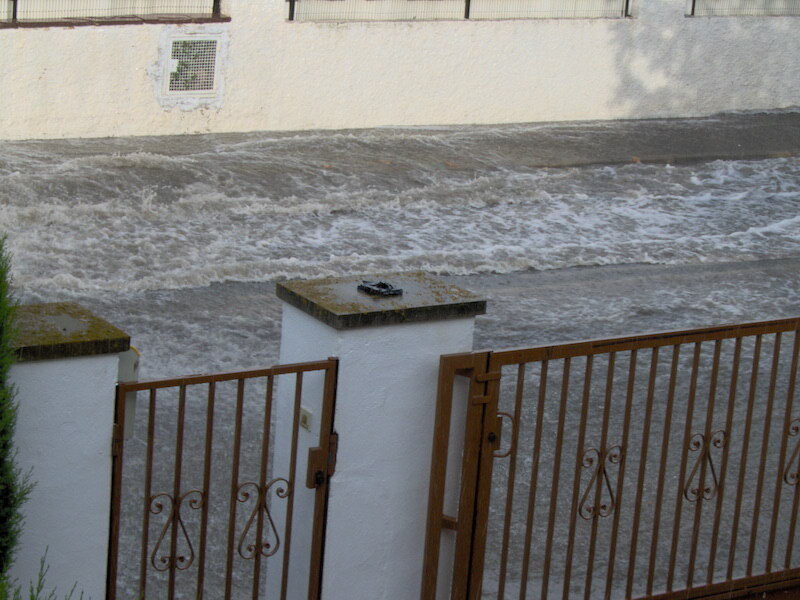 The following picture, taken in August 2008 in the street envisaged for the intended operation, shows the flooding of this public thoroughfare after a torrential episode in summer. The impermeability of the street paving and the absence of an appropriate drainage system (scuppers) favoured surface run-off. 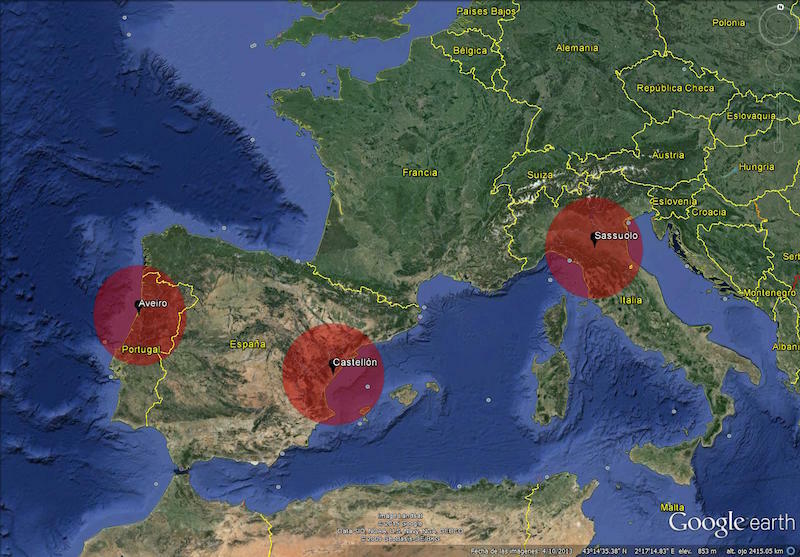 This is a common situation on the Mediterranean seaboard when episodes of convective rainfall occur. 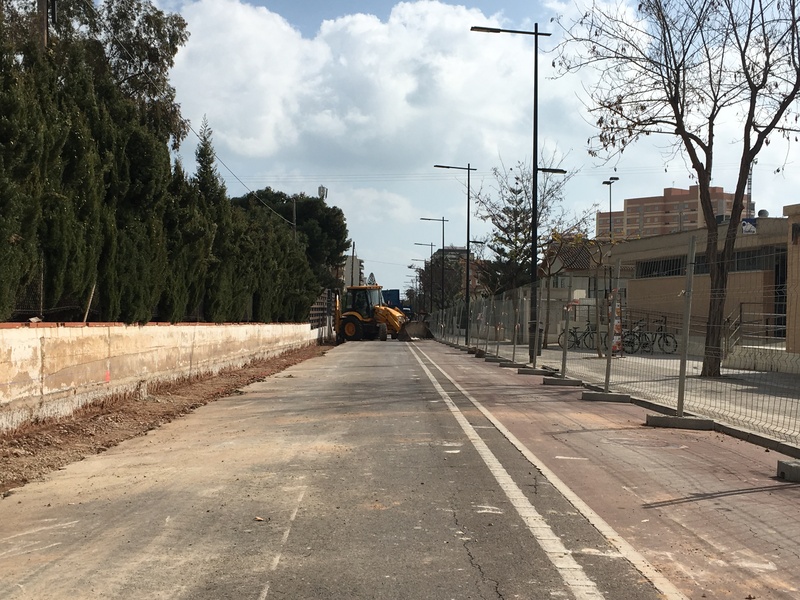 Concerning the road section, the project maintains the current operation consisting of a central one-way roadway, in parallel to a bicycle lane and two pedestrian sidewalks. 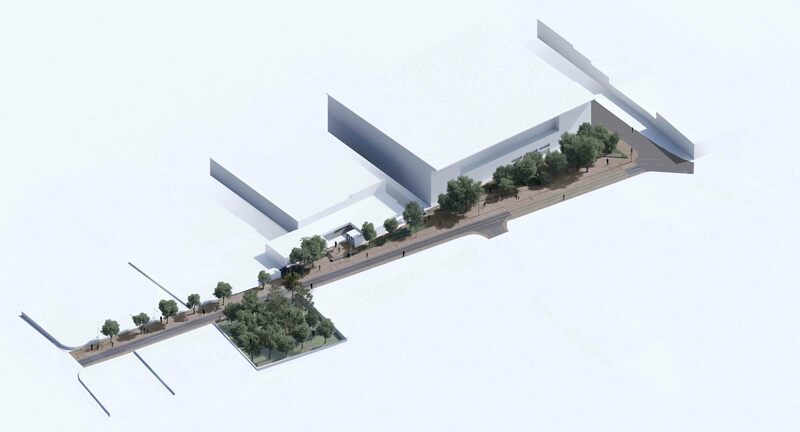 The demonstrator has also addressed the improvement of access conditions to public spaces by adapting this section to a single platform solution with a 2% cross section slope towards the cycle lane, obtaining a section of street resolved on a single level that, added to its 1.5% longitudinal slope, makes possible to provide accessible routes to public facilities. 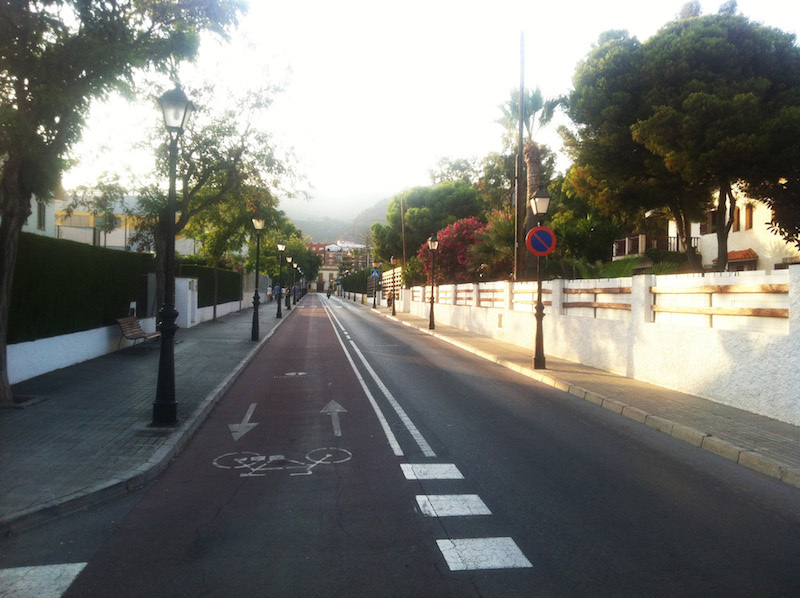 Likewise, as an improvement of the conditions of use, the function of the area located in front of the Sports Centre is reinforced acting as a garden rest point on the route from the city centre to the beach. 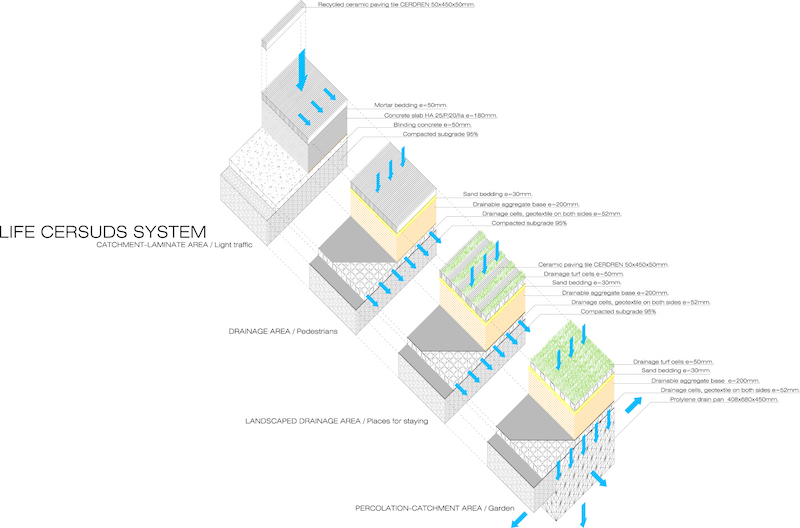 Regarding the installed Sustainable Drainage System (SuDS), the demonstration site moves from the former situation consisting of a sealed surface with collection of urban runoff by means of traditional sewer systems connected to a rainwater collector, to a new solution consisting of a permeable pavement made up of ceramic paving blocks of low commercial value placed on site to facilitate percolation , reduce runoff and improve water quality. Modular storage cells have been located along the bicycle lane, including additional storage to allow reusing water for irrigation of gardening areas. The system acts as a collector reducing the contribution of runoff water to the traditional sewer network. The project has been developed by F-VA studio "Fernandez-Vivancos Architect" (http://www.fernandez-vivancos.com/article/life-cersuds) with the participation of Eduardo de Miguel Arbonés. 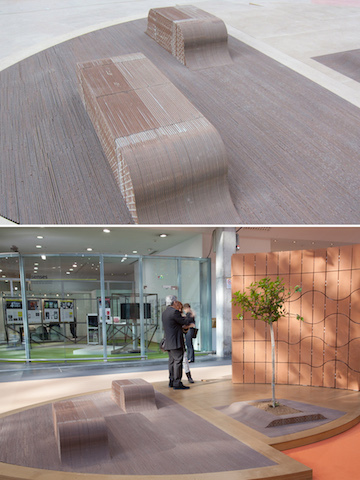 LIFE CERSUDS puts forward an innovative permeable ceramic flooring that originated in an R&D project funded by the Autonomous Government of the Valencia Region in 2010 entitled “Reuse and recycling of discontinued products and manufacturing scrap for the generation of new products”, Ref. IMIDIC/2010/73. The permeable flooring is based on the use of ceramic tiles of low commercial value. The system envisages cutting the ceramic tiles into strips of specific width, which will then be bundled into permeable ceramic units. The development of these units provides speed and simplicity in flooring installation. Specifications will be defined in the development of the project, the permeable ceramic system being designed, tested, and validated from a performance, economic, and environmental viewpoint to assure system durability and to foster its incorporation into urban spaces through the development of a design manual and instructional material for universities. 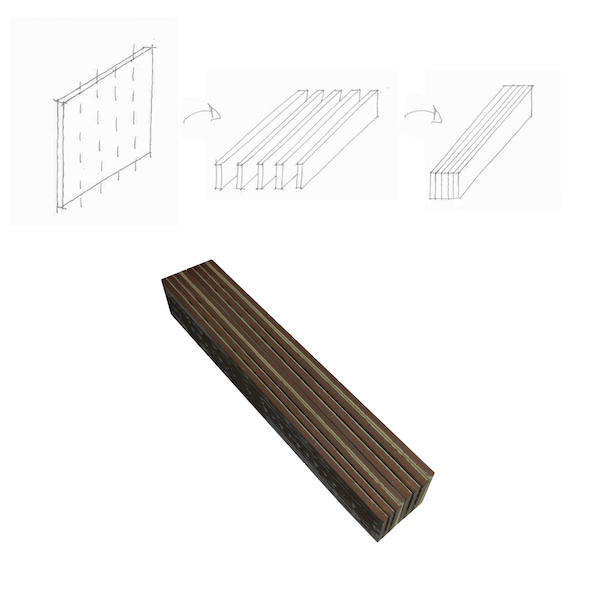 (The following figure shows several construction solutions of the permeable ceramic system to allow the adaptation to different urban spatial requirements). Implementation of the demonstrator started in February 2018 and is scheduled for completion in June 2018. Once executed, the demonstrator will be monitored for one year in order to evaluate and validate the results regarding hydraulic performance. During CERSUDS project development, two pre-projects will also be carried out: one in the Aveiro region (Portugal) and the other in the Fiorano region (Italy), countries with ceramic clusters and climate problems similar to those of Spain. These projects will be evaluated by both municipalities in order to foster the system’s replicability.